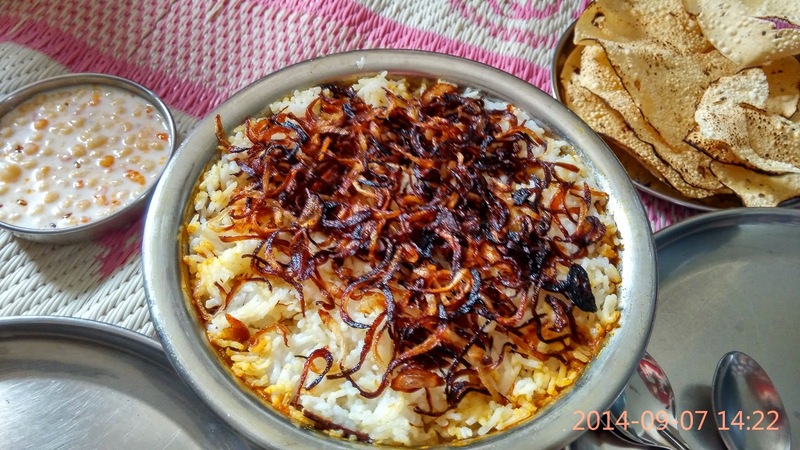 This one is for RM & my BFF who have been demanding the recipe after I posted some drool-worthy images of the said Biryani. 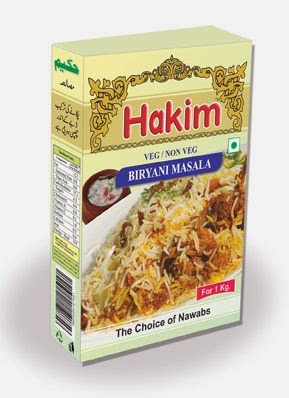 Hakim's Biryani Masala - This one is a major find, if you can not find it look for some other brand but this is too good. In a big vessel put water (a lot extra than is usually needed) to boil. Drain the rice and once the water is boiling dunk it in it. Add one star anise, a little cinnamon & one tej patta in it and let it cook till the point it is 90% cooked. Drain the excess water out and spread the rice in a flat big vessel. Don't forget to add a little ghee before spreading it out. Also boil the eggs and once they are cold cut them into slices. Warm the milk and add the saffron strands in it. Take one onion and cut it into fine slices. Heat the Ghee in a kadhai and deep fry these slices till they are golden brown. Remember to separate the slices before frying. Let it drain on a tissue paper and keep it aside. Make a paste out of the ginger & garlic and finely chop the remaining onion & tomatoes. In the ghee (left after frying the onions) add jeera, green chilly and the other garam masala. Once it starts spluttering add the ginger garlic paste, letting it cook for a minute. Now add the onion and let it cook. As it turns pinkish brown add the Biryani masala. I had dunked half of it because I wanted the biryani to be spicy. Let it cook for a minute or two and then add the chopped tomatoes. Cover it and let it cook. 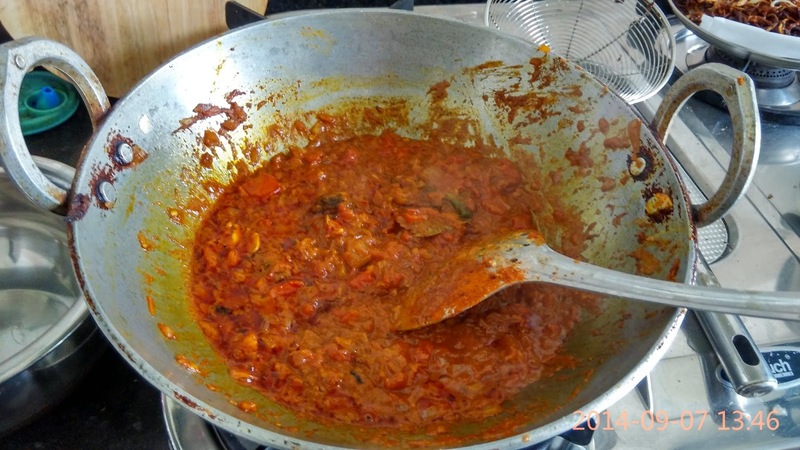 Once the ghee starts separating add the curd and bhunofy the masala. Turn the gas off when the ghee has separated. 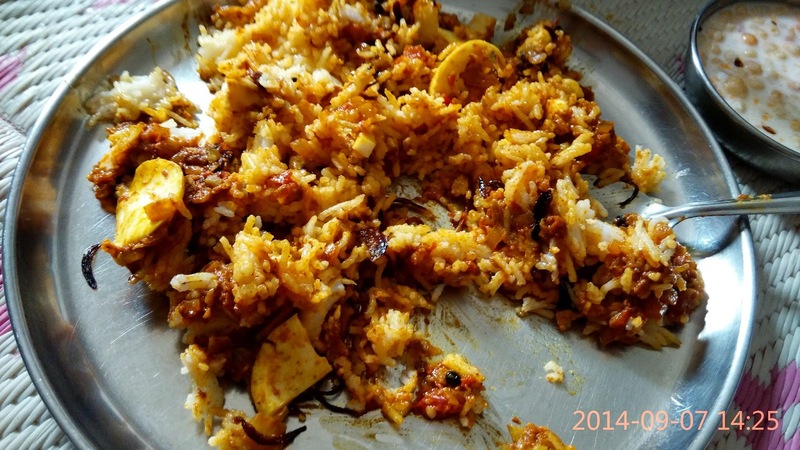 Keep the rice, cooked gravy, milk, eggs & fried onion at hand. Now take a heavy based vessel, grease it with oil. 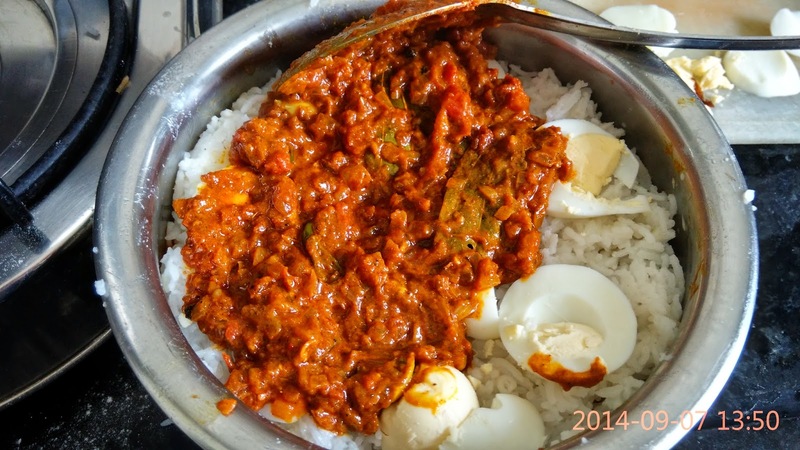 Add a layer of rice, over it arrange the egg slices, then spread the gravy generously. Add a layer of rice over it pour a little milk on it and garnish with onions. 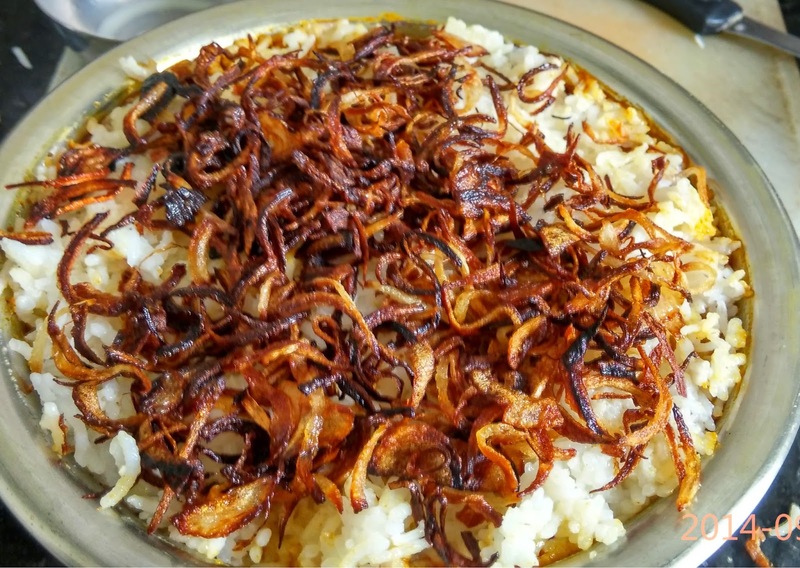 Then repeat the process of layering, eggs go in first followed by gravy, rice, milk and fried Onions. Keep doing till the rice and gravy are finished. I had managed to make three layers. Finally at the top pour the remaining milk garnish with the fried onions and coriander leaves. Now cover the vessel with a plate and seal it either with roti ka aata or aluminium foil. Turn the gas onn and keep it on low flame, keep a tawa on it and put the vessel above it. Let it cook for 10-15 minutes (depending on how cooked your rice was). Turn the gas off. Open the vessel, enjoy the heavenly aroma and serve it with Raita/ Salad / Papad. The amount of gravy that you need to spread depends on the total quantity you have in hand. Same goes with rice, like in my case I had excess rice so I kept some aside because too much rice would have taken away the taste. 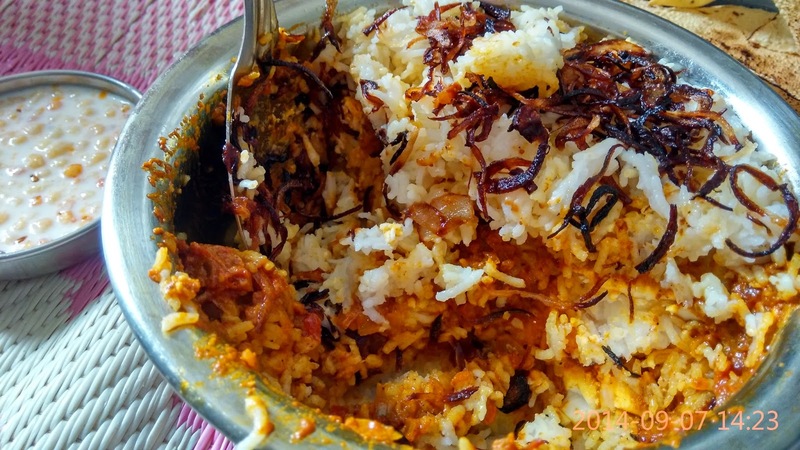 In case you don't find the Biryani Masala then all you need to add is turmeric powder, red chilly powder, Dhaniya Powder and a little more of the garam masala that I have suggested. But I would recommend that you some ready to use biryani masala. When you put the rice to boil do add salt in it. Instead of cutting the slices of eggs you can even half it and use it.